Utilities was the second-best performing sector on SGX in Feb, with a total return of 7.4%, after IT sector’s 14.5% total return. Utilities also saw net inflows of S$1.5 million from institutional investors, the second straight month of net inflows after S$7.0 million in Jan.
SGX lists 10 stocks that provide infrastructure for water, wastewater treatment and supply services, and they have a combined market capitalisation of nearly S$10 billion. In the 2019 YTD, the 3 largest capitalised, best-performing water plays were: SIIC Environment (+34.5%), CITIC Envirotech (+18.4%), and China Everbright Water (+18.3%). The trio, which are focused on China’s water sector, averaged a total return of +23.8% in the YTD. Utility stocks maintain infrastructure that supply water, electricity, gas and waste removal services, with population growth the underlying driver of demand for these services. 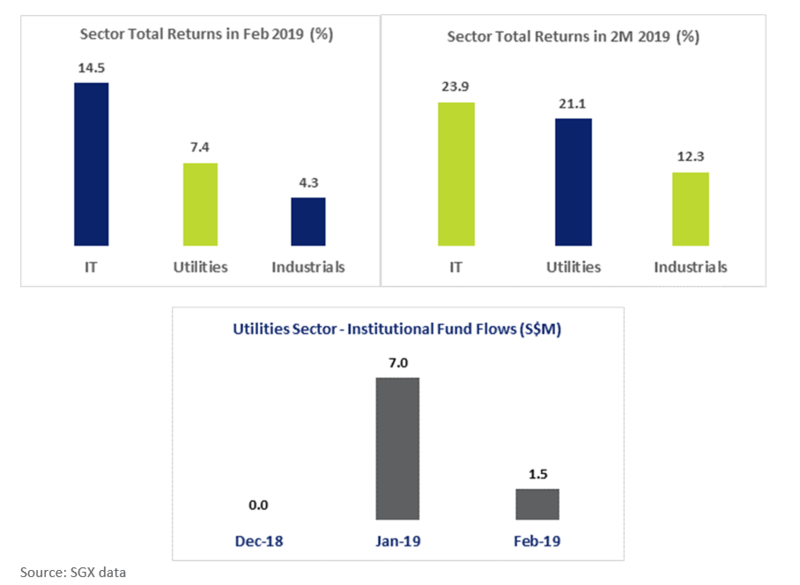 For the month of February, Utilities was the second-best performing sector on SGX with a total return of 7.4%, after Information Technology’s 14.5% total return. Utilities also saw net inflows of S$1.5 million from institutional investors in February, the second straight month of net inflows after S$7.0 million in January. SGX lists 10 stocks that provide infrastructure for water as well as wastewater treatment and supply services, and they have a combined market capitalisation of nearly S$10 billion. Among the 10, the 5 largest capitalised water infrastructure plays are: Sembcorp Industries, Keppel Infrastructure Trust, CITIC Envirotech, SIIC Environment and China Everbright Water. 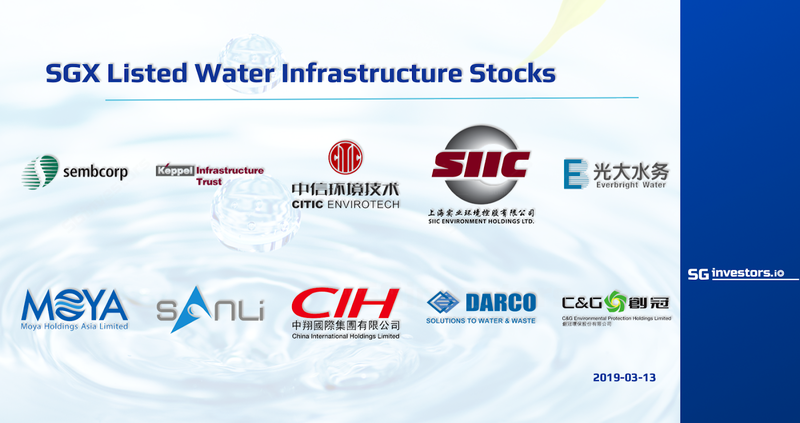 In the 2019 year-to-date, the 3 largest capitalised, best-performing water stocks were: SIIC Environment (+34.5%), CITIC Envirotech (+18.4%), and China Everbright Water (+18.3%). The trio averaged a total return of +23.8% in the YTD, bringing their one-year and three-year total returns to -26.8% and -34.7% respectively. They also average a dividend yield of 3.3%. These 3 stocks focus on China’s water sector, and specialise in environmental water services that include building and managing water and wastewater treatment plants, water supply and recycling, seawater desalination, sludge treatment, as well as development of other water technologies. The table below details the 10 water infrastructure plays listed on SGX, sorted by market capitalisation. With nearly 20% of the world’s population and only about 6% of global freshwater resources, China’s water sector is a high priority for the country’s policy makers. With the government’s push towards environmental protection, demand for wastewater treatment facilities has increased across all sectors. Demand among industrial users has also been strong, due to more stringent environmental regulation and enforcement. In its 13th Five Year Plan, China aims to spend around RMB 559 billion (US$83 billion) – or about 0.75% of its GDP – on its water treatment industry. According to data from Research and Markets, the Chinese wastewater treatment market is forecast to reach US$58.2 billion by 2022, from US$42.1 billion in 2017, reflecting a compound annual growth rate (CAGR) of 6.7% over the period.